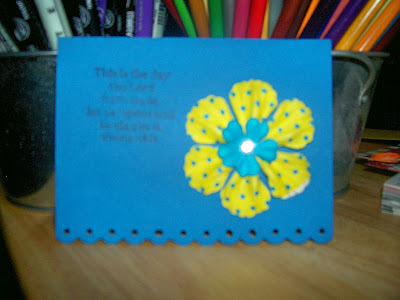 Confessions of a 20-something Scrapbooking Mother: Card for Angel's #14 Challenge! Ok, you can't read that AT ALL, but this was the best I could get! The challenge was to use 1 layer of cardstock, and I got that from my scraps. I added a Prima stack and a rhinestone in the middle. The stamp is Stampin Up! and says "This is the day the Lord hath made, let us rejoice and be glad in it. -Psalms 118:24" I got this set at a yard sale for a few dollars this summer! Well, thats all for me today! I need to clean and I'm going to spend time with my guys! Happy Sunday! You rocked this challenge, Becky! Great card! Very nice! Oh my goodness, I just noticed the Halloween photo at the top! How cute are they?!! So sweet!